The Minister of Finance, Mr Ken Ofori-Atta, has revealed that food imports cost the nation an average of US$2.4 billion every year. This means that about GH¢10.8 billion (one dollar to GH¢4.5) is used to import rice, sugar, sorghum, frozen chicken and meat, among other food items, for domestic and industrial consumption on annual basis. At US$2.4 billion, the cost of food imports is about a quarter of the value of non-oil imports, which closed 2017 at US$10.66 billion. While bemoaning the impact of the huge food import bill on the economy, the minister told members of the Ghana Trades Union Congress (TUC) in Accra that the development was fueled by the corresponding strong appetite for imported consumables. He said the importers were only taking advantage of a business opportunity that had been occasioned by a deficit in food supply and a strong preference for imported food. The President of the Chamber of Agribusiness, Mr Anthony Morrison, said the dwindling fortunes of the sector were a reflection of how state funding had eluded the sector over the years. Unlike other sectors, which are directly funded by state resources, Mr Morrison said the funding of agricultural activities was left to donors, making it difficult for growth enhancing programmes to achieve their desired objectives. He intimated that almost 70 per cent of agric programmes were currently financed by donors, whose facilities were mostly channelled into administrative expenses and wages and salaries rather than capital expenditure. That, he said, contributed to the sluggish nature of growth in the sector, leading to a hike in food imports to supplement dwindling domestic output. Beyond being an outcome of the country’s strong appetite for imports, the huge food import bill reflects the sorry state of the agricultural sector over the years. Since 2009, the sector’s contribution has been on a steady decline, with its share of national economic output, measured by gross domestic product (GDP), dropping from 31.8 per cent to 18.3 per cent in 2017. Its annual growth rate has also been wobbly. From 7.2 per cent in 2009, growth in the sector declined to 0.8 per cent in 2011 before inching up to 2.3 per cent in 2012. In 2016, the sector grew by three per cent but rebounded to 8.4 per cent in 2017 on the back of strong growth in the cocoa and fishing subsectors. As a result, he disagreed with suggestions from some members of the TUC that the government should clamp down on importers to help save the nation the impact of the huge financial outflow to fund food imports. 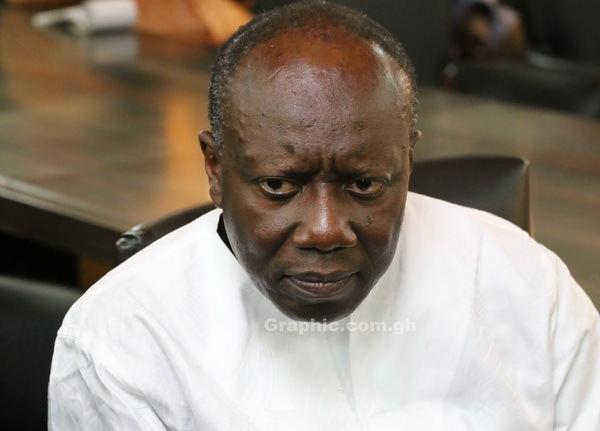 Rather than restricting food importers on quota basis, Mr Ofori-Atta said the country could adopt a holistic approach that would help ramp up local production in the short to medium term for imports to fall. “It is almost not about the people importing; it is about us agreeing that there will be some shortfalls for the next three, four or five years as we ramp up our production,” he said. He mentioned soft loans for farmers, increased on tariffs imports and a conscious effort to consume locally produced goods as some of the strategies the country could adopt to help curtail the rising food import bill. Mr Morrison also blamed the low output in the agricultural sector on the quality of seeds used by local farmers. “If as a country we have control over seed breeding, where we can develop the ecosystem needed for seed breeding to be industrious, then we will be able to cut off some of the imports. The fact is that most of the seeds that our farmers use have low penetration rates,” he said. On funding, he said the shirking of the funding responsibility by the government to donors meant that the country was at the beck and call of such development partners. He mentioned the Planting for Food and Jobs (PFJ) programme and the Agricultural Marshal Plan as some critical national programmes that could have helped to lift growth in agric if they were funded by the government directly. “For instance, why is the Agric Marshall Plan not being implemented now? It is because it is government funded and it has collapsed. Two years now, nobody has heard anything now about it,” he said. The plan, which was announced in 2017, was to help inject some GH¢700 million into the agriculture sector to help modernise key projects, procure and subsidise equipment for farmers, among others.